The following post is by Dr Brooke Simmons, who has been leading the Zooniverse efforts to help in the aftermath of the recent Caribbean storms. This year has seen a particularly devastating storm season. As Hurricane Irma was picking up steam and moving towards the Caribbean, we spoke to our disaster relief partners at Rescue Global and in the Machine Learning Research Group at Oxford and decided to activate the Planetary Response Network. We had previously worked with the same partners for our responses to the Nepal and Ecuador earthquakes in 2015 and 2016, and this time Rescue Global had many of the same needs: maps of expected and observed damage, and identifications of temporary settlements where displaced people might be sheltering. The Planetary Response Network is a partnership with many people and organizations and which uses many sources of data; the Zooniverse volunteers are at its heart. The first cloud-free data available following the storm was of Guadeloupe, and our community examined pre-storm and post-storm images, marking building damage, flooding, impassable roads and signs of temporary structures. The response to our newsletter was so strong that the first set of data was classified in just 2 hours! And as more imaging has become available, we’ve processed it and released it on the project. By the time Hurricane Maria arrived in the Caribbean, Zooniverse volunteers had classified 9 different image sets from all over the Caribbean, additionally including Turks and Caicos, the Virgin Islands (US and British), and Antigua & Barbuda. That’s about 1.5 years’ worth of effort, if it was 1 person searching through these images as a full-time job. Even with a team of satellite experts it would still take much longer to analyze what the Zooniverse volunteers collectively have in just days. And there’s still more imaging: the storms aren’t over yet. We’ve been checking in every day with Rescue Global and our Machine Learning collaborators to get feedback on how our classifications are being used and to refresh the priority list for the next set of image targets. As an example of one of those adjustments, yesterday we paused the Antigua & Barbuda dataset in order to get a rapid estimate of building density in Puerto Rico from images taken just before Irma and Maria’s arrival. We needed those because, while the algorithms used to produce the expected damage maps do incorporate external data like Census population counts and building information from OpenStreetMaps, some of that data can be incomplete or out of date (like the Census, which is an excellent resource but which is many years old now). Our volunteers collectively provided an urgently needed, uniformly-assessed and up-to-date estimate across the whole island in a matter of hours — and that data is now being used to make expected damage maps that will be delivered to Rescue Global before the post-Maria clouds have fully cleared. With volunteer classifications as inputs, we were able to deliver maps like this (and similar versions for flooding, road blockage, and temporary shelters) for every island we classified. We also incorporated other efforts like those of Tomnod to map additional islands, so that we could keep our focus on areas that hadn’t yet been covered while still providing as much accurate information to responders as possible. In addition to supplying an NGO with satellite communications on St Thomas island, the team also evacuated a small number of patients with critical healthcare needs (including a pregnant lady) to San Juan. Both missions were aided by the heat maps. To me, this illustrates what we can all do together. Everyone has different roles to play here, from those who have a few minutes a day to contribute to those spending hours clicking and analyzing data, and certainly including those spending hours huddled over a laptop in a temporary base camp answering our emailed questions about project design and priorities while the rescue and response effort goes on around them. Without all of them, none of this would be possible. We’re still going, now processing images taken following Hurricane Maria. But we know it’s important that our community be able to share the feedback we’ve been receiving, so even though we aren’t finished yet, we still wanted to show you this and say: thank you. Now that the project’s active response phase has completed, we have written a further description of how the maps our volunteers helped generate were used on the project’s Results page. Additionally, every registered volunteer who contributed at least 1 classification to the project during its active phase is credited on our Team page. Together we contributed nearly 3 years’ worth of full-time effort to the response, in only 3 weeks. Firstly, our brilliant volunteers. To date on this project we have had contributions from about 10,000 unique IP addresses, of which about half are from registered Zooniverse accounts. The PRN has been supported by Imperative Space and European Space Agency as part of the Crowd4Sat programme. Any views expressed on this website shall in no way be taken to represent the official opinion of ESA. The development of the current Zooniverse platform has been supported by a Google Global Impact award and the Alfred P. Sloan Foundation. We are grateful to Patrick Meier and QCRI for their partnership in the development of PRN. We are grateful to those whose counsel (and data!) 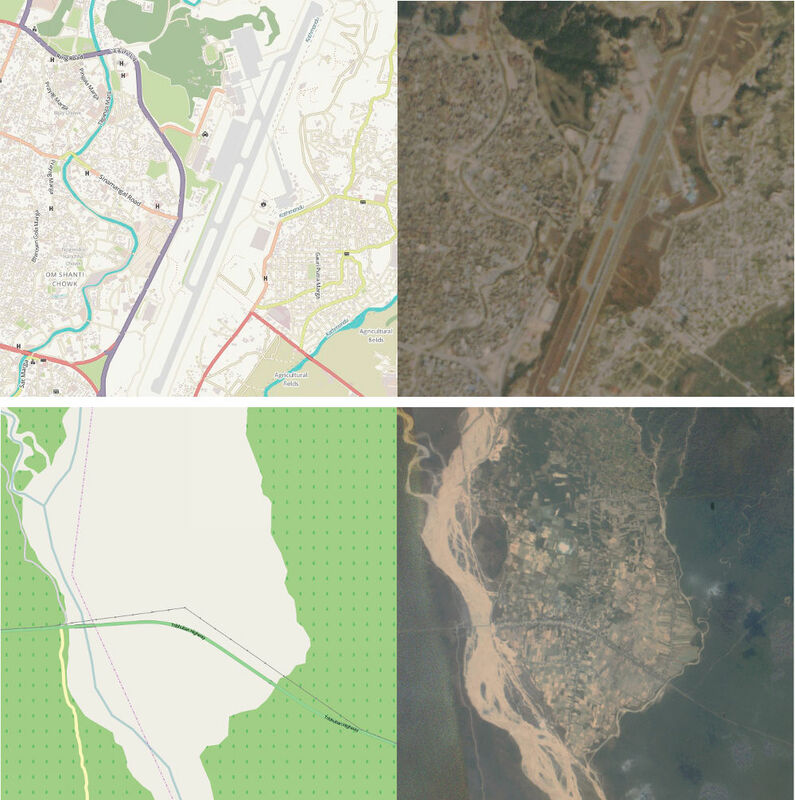 we have been fortunate to receive over the years: the Humanitarian OpenStreetMap Team, the Standby Task Force, Tomnod. 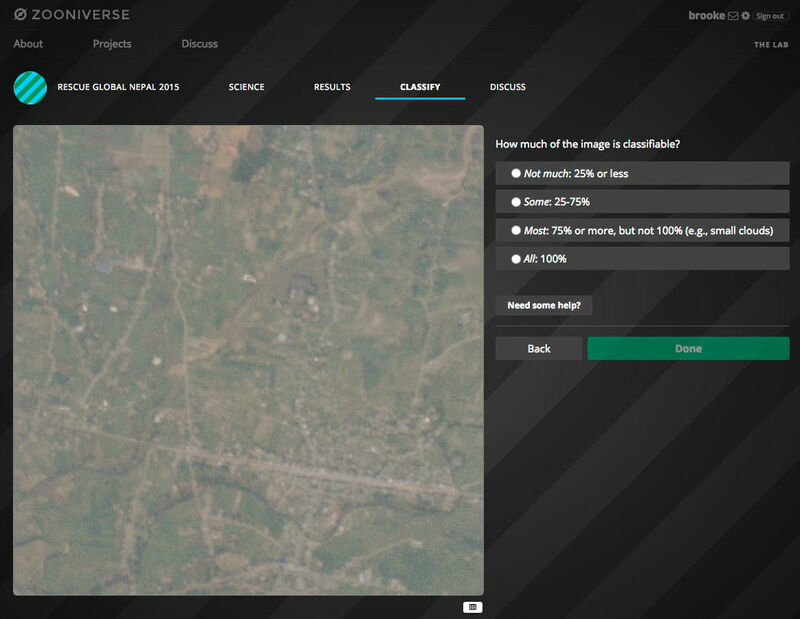 DigitalGlobe provides high-resolution imagery as part of their Open Data Program (Creative Commons Attribution Non Commercial 4.0). Thanks to the USGS for making Landsat 8 images publicly available. Thanks to ESA for making Sentinel-2 images publicly available. The Zooniverse team members, who are absolute stars for jumping in and helping out at a moment’s notice. 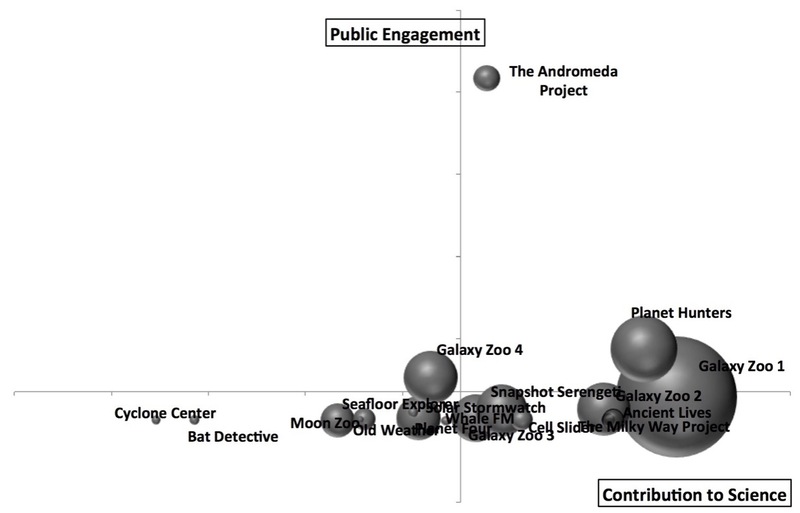 Public Engagement vs Contribution to Science for 17 Zooniverse projects. The size (area) of each point is proportional to the total number of classifications received by the project. Each axis of this plot combines 6 different quantitative project measures. The aim of this post is to answer the questions: What does it mean? And what doesn’t it mean? The obvious implication of this plot and of the paper in general is that projects that do well in both public engagement and contribution to science should be considered “successful” citizen science projects. There’s still room to argue over which is more important, but I personally assert that you need both in order to justify having asked the public to help with your research. As a project team member (I’m on the Galaxy Zoo science team), I feel very strongly that I have a responsibility both to use the contributions of my project’s volunteers to advance scientific research and to participate in open, two-way communication with those volunteers. And as a volunteer (I’ve classified on all the projects in this study), those are the 2 key things that I personally appreciate. It’s apparent just from looking at the success matrix that one can have some success at contributing to science even without doing much public engagement, but it’s also clear that every project that successfully engages the public also does very well at research outputs. So if you ignore your volunteers while you write up your classification-based results, you may still produce science, though that’s not guaranteed. On the other hand, engaging with your volunteers will probably result in more classifications and better/more science. Some of the projects on the matrix didn’t appear quite where we expected. I was particularly surprised by the placement of Old Weather. On this matrix it looks like it’s turning in an average or just-below-average performance, but that definitely seems wrong to me. And I’m not the only one: I think everyone on the Zooniverse team thinks of the project as a huge success. Old Weather has provided robust and highly useful data to climate modellers, in addition to uncovering unexpected data about important topics such as the outbreak and spread of disease. It has also provided publications for more “meta” topics, including the study of citizen science itself. Additionally, Old Weather has a thriving community of dedicated volunteers who are highly invested in the project and highly skilled at their research tasks. Community members have made millions of annotations on log data spanning centuries, and the researchers keep in touch with both them and the wider public in multiple ways, including a well-written blog that gets plenty of viewers. I think it’s fair to say that Old Weather is an exceptional project that’s doing things right. So what gives? There are multiple reasons the matrix in this study doesn’t accurately capture the success of Old Weather, and they’re worth delving into as examples of the limitations of this study. Many of them are related to the project being literally exceptional. Old Weather has crossed many disciplinary boundaries, and it’s very hard to put such a unique project into the same box as the others. Firstly, because of the way we defined project publications, we didn’t really capture all of the outputs of Old Weather. The use of publications and citations to quantitatively measure success is a fairly controversial subject. Some people feel that refereed journal articles are the only useful measure (not all research fields use this system), while others argue that publications are an outdated and inaccurate way to measure success. For this study, we chose a fairly strict measure, trying to incorporate variations between fields of study but also requiring that publications should be refereed or in some other way “accepted”. This means that some projects with submitted (but not yet accepted) papers have lower “scores” than they otherwise might. It also ignores the direct value of the data to the team and to other researchers, which is pretty punishing for projects like Old Weather where the data itself is the main output. And much of the huge variety in other Old Weather outputs wasn’t captured by our metric. If it had been, the “Contribution to Science” score would have been higher. Secondly, this matrix tends to favor projects that have a large and reasonably well-engaged user base. Projects with a higher number of volunteers have a higher score, and projects where the distribution of work is more evenly spread also have a higher score. This means that projects where a very large fraction of the work is done by a smaller group of loyal followers are at a bit of a disadvantage by these measurements. Choosing a sweet spot in the tradeoff between broad and deep engagement is a tricky task. Old Weather has focused on, and delivered, some of the deepest engagement of all our projects, which meant these measures didn’t do it justice. To give a quantitative example: the distribution of work is measured by the Gini coefficient (on a scale of 0 to 1), and in our metric lower numbers, i.e. more even distributions, are better. The 3 highest Gini coefficients in the projects we examined were Old Weather (0.95), Planet Hunters (0.93), and Bat Detective (0.91); the average Gini coefficient across all projects was 0.82. It seems clear that a future version of the success matrix should incorporate a more complex use of this measure, as very successful projects can have high Gini coefficients (which is another way of saying that a loyal following is often a highly desirable component of a successful citizen science project). Thirdly, I mentioned in part 1 that these measures of the Old Weather classifications were from the version of the project that launched in 2012. That means that, unlike every other project studied, Old Weather’s measures don’t capture the surge of popularity it had in its initial stages. To understand why that might make a huge difference, it helps to compare it to the only eligible project that isn’t shown on the matrix above: The Andromeda Project. In contrast to Old Weather, The Andromeda Project had a very short duration: it collected classifications for about 4 weeks total, divided over 2 project data releases. It was wildly popular, so much so that the project never had a chance to settle in for the long haul. A typical Zooniverse project has a burst of initial activity followed by a “long tail” of sustained classifications and public engagement at a much lower level than the initial phase. And this study was done before the project’s first paper was accepted, which it has now been. If we included that, The Andromeda Project’s position would be even further to the right as well. Because we try to control for project duration, the very short duration of the Andromeda Project means it gets a big boost. Thus it’s a bit unfair to compare all the other projects to The Andromeda Project, because the data isn’t quite the same. However, that’s also true of Old Weather — but instead of only capturing the initial surge, our measurements for Old Weather omit it. These measurements only capture the “slow and steady” part of the classification activity, where the most faithful members contribute enormously but where our metrics aren’t necessarily optimized. That unfairly makes Old Weather look like it’s not doing as well. In fact, comparing these 2 projects has made us realize that projects probably move around significantly in this diagram as they evolve. Old Weather’s other successes aren’t fully captured by our metrics anyway, and we should keep those imperfections and caveats in mind when we apply this or any other success measure to citizen science projects in the future; but one of the other things I’d really like to see in the future is a study of how a successful project can expect to evolve across this matrix over its life span. Why do astronomy projects do so well? There are multiple explanations for why astronomy projects seem to preferentially occupy the upper-right quadrant of the matrix. First, the Zooniverse was founded by astronomers and still has a high percentage of astronomers or ex-astronomers on the payroll. For many team members, astronomy is in our wheelhouse, and it’s likely this has affected decisions at every level of the Zooniverse, from project selection to project design. That’s starting to change as we diversify into other fields and recruit much-needed expertise in, for example, ecology and the humanities. We’ve also launched the new project builder, which means we no longer filter the list of potential projects: anyone can build a project on the Zooniverse platform. So I think we can expect the types of projects appearing in the top-right of the matrix to broaden considerably in the next few years. The second reason astronomy seems to do well is just time. Galaxy Zoo 1 is the first and oldest project (in fact, it pre-dates the Zooniverse itself), and all the other Galaxy Zoo versions were more like continuations, so they hit the ground running because the science team didn’t have a steep learning curve. In part because the early Zooniverse was astronomer-dominated, many of the earliest Zooniverse projects were astronomy related, and they’ve just had more time to do more with their big datasets. More publications, more citations, more blog posts, and so on. We try to control for project age and duration in our analysis, but it’s possible there are some residual advantages to having extra years to work with a project’s results. Moreover, those early astronomy projects might have gotten an additional boost from each other: they were more likely to be popular with the established Zooniverse community, compared to similarly early non-astronomy projects which may not have had such a clear overlap with the established Zoo volunteers’ interests. 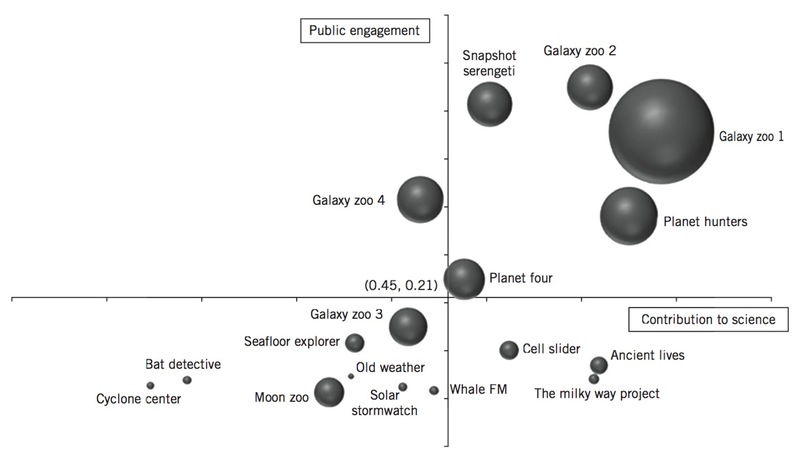 The citizen science project success matrix presented in Cox et al. 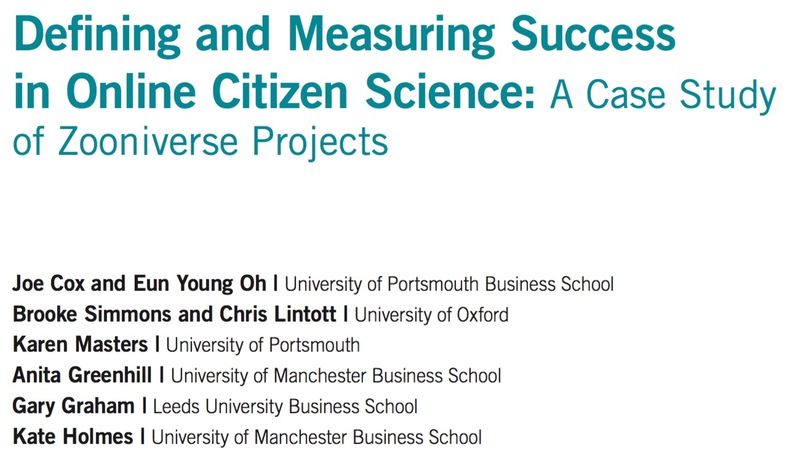 (2015) is the first time such a diverse array of project measures have been combined into a single matrix for assessing the performance of citizen science projects. We learned during this study that public engagement is well worth the effort for research teams, as projects that do well at public engagement also make better contributions to science. It’s also true that this matrix, like any system that tries to distill such a complex issue into a single measure, is imperfect. There are several ways we can improve the matrix in the future, but for now, used mindfully (and noting clear exceptions), this is generally a useful way to assess the health of a citizen science project like those we have in the Zooniverse. Note: Part 1 of this article is here. What makes one citizen science project flourish while another flounders? Is there a foolproof recipe for success when creating a citizen science project? As part of building and helping others build projects that ask the public to contribute to diverse research goals, we think and talk a lot about success and failure at the Zooniverse. But while our individual definitions of success overlap quite a bit, we don’t all agree on which factors are the most important. Our opinions are informed by years of experience, yet before this year we hadn’t tried incorporating our data into a comprehensive set of measures — or “metrics”. So when our collaborators in the VOLCROWE project proposed that we try to quantify success in the Zooniverse using a wide variety of measures, we jumped at the chance. We knew it would be a challenge, and we also knew we probably wouldn’t be able to find a single set of metrics suitable for all projects, but we figured we should at least try to write down one possible approach and note its strengths and weaknesses so that others might be able to build on our ideas. In this study, we only considered projects that were at least 18 months old, so that all the projects considered had a minimum amount of time to analyze their data and publish their work. For a few of our earliest projects, we weren’t able to source the raw classification data and/or get the public-engagement data we needed, so those projects were excluded from the analysis. We ended up with a case study of 17 projects in all (plus the Andromeda Project, about which more in part 2).